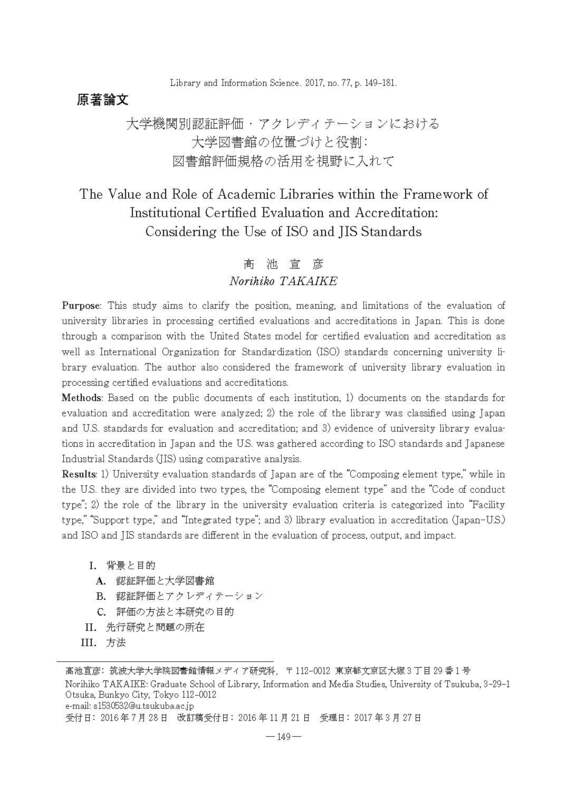 Purpose : This study aims to clarify the position, meaning, and limitations of the evaluation of university libraries in processing certified evaluations and accreditations in Japan. This is done through a comparison with the United States model for certified evaluation and accreditation as ell as International Organization for Standardization (ISO) standards concerning university library evaluation. The author also considered the framework of university library evaluation in processing certified evaluations and accreditations. Methods : Based on the public documents of each institution, 1) documents on the standards for evaluation and accreditation were analyzed ; 2) the role of the library was classified using Japan and U.S. standards for evaluation and accreditation ; and 3) evidence of university library evaluations in accreditation in Japan and the U.S. was gathered according to ISO standards and Japanese Industrial Standards (JIS) using comparative analysis. Results : 1) University evaluation standards of Japan are of the "Composing element type," while in the U.S. they are divided into two types, the "Composing element type" and the "Code of conduct type" ; 2) the role of the library in the university evaluation criteria is categorized into "Facility type," "Support type," and "Integrated type" ; and 3) library evaluation in accreditation (Japan‒U.S.) and ISO and JIS standards are different in the evaluation of process, output, and impact.